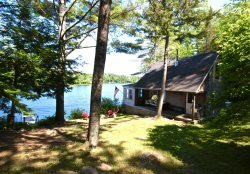 Think peaceful, tree laden haven with the sounds of lobster boats humming in the distance when you think of Settlers Cottage in Cushing. Originally built by the owner’s grandfather, this adorable cottage has recently been renovated. All of the original charm remains but you no longer have to “rough it” in any sense of the word. Situated on a hillside, the property overlooks large, mature trees and Collins Cove and original stone walls crisscross the property. The cottage is outfitted with an expansive wraparound deck with a grill and deck furniture. Have a lobster dinner at the picnic table or relax with a book and a glass of wine at the end of the day. This is the perfect spot. Inside, the cottage has stunning “v-notched” wood, hardwood floors, lots of large windows and the vaulted ceiling in the kitchen/dining room area offers a feeling of spaciousness and airiness. The kitchen shares a space with the dining area – the dining area overlooks the waterfront and the deck and it a perfect spot for meal, games or puzzles. The living room has a stunning porcelain propane-fired wood-stove, a couch and a comfortable chair – this room also overlooks the deck and the waterfront. There is a shower bathroom as well, adjacent to the master bedroom – the master has a queen bed. Upstairs is a sweet loft – open to the downstairs, accessed by a ship’s ladder and, the best part, offering views from 3 windows. The loft has two twin platform beds. The cottage is equipped with cable television, a flat-screen TV, DVD player and wireless cable Internet. If you are looking for a simple getaway – without having to completely disconnect – this cottage is a fantastic option. Thomaston is just 5 miles away, Rockland is 10 and Camden is 20. Water access is possible, but difficult due to the configuration of the shoreline.